Description: Beautiful luxury All Wheel Drive Coupe, powered by BMW’s famous 3 Liter Straight 6, Automatic Transmission with Paddle Shifters, Ice Cold Air Conditioning, Power Windows and Locks, Tilt Wheel, Cruise Control, ABS, Dual Power Heated Leather Seats, Power Moon Roof, Factory Alloy Wheels wrapped in matching Continental Radials, Factory Driving Lights, Premium Sound System, and so much more. Never smoked in, just professionally detailed, all books, professionally tinted windows too! 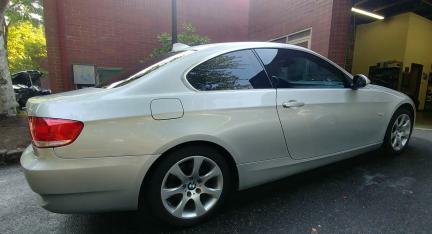 A beautiful, affordable BMW for you to head to the ski slopes with!